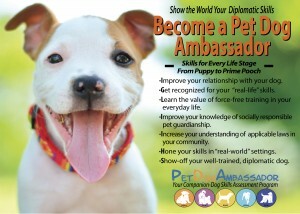 Would You Like To Turn Your Pet Dog Into an Ambassador! Yes! – Then you are in the right place. 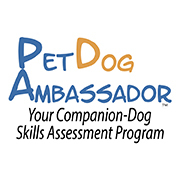 Through our 5 step PDA credentialing program you can teach your pet some much needed life skills in a fun and supportive environment, helping your pet become the Ambassador they deserve to be in your family and community. The PDA program builds over five levels to the Championship Level. Dogs as young as 4 months of age can enroll and begin gaining their first credentials very quickly learning these important skills. For a pet dog that has reached 6 months of age you can begin them at level 2. Your pet will learn about car manners, how to enter and leave buildings. How to leave and recall back to you. And let’s not forget stay or settle! Levels 3 and Level 4 build further on the dogs’ and Guardians’ skills, knowledge and ability and culminate in assessments both in real life settings and in the class situation. This level is where everything the dog and Guardian have learned is put to the test in real life settings. There are location options available to help assessors make real life training relevant to their clients. Assessors will be able to create scenarios that may be appropriate to their local surroundings provided they include all of the compulsory exercises and two from the selection of optional exercises. Before your skills are assessed you will need to register with PDA and take the short open book quiz. This focuses on responsible pet ownership. There is a manual to support this quiz. The manual is a guide to pet care and the link is below. Then when you have completed the quiz you can provide your DogSmith Licensed PDA Instructor or Instructor/Assessor with your proof of vaccinations and your test result and you are ready for your first level assessment. Click here to get going and enroll your dog. The assessment guide below will take you through each of the five levels and the skills required for each level. If you need help learning these skills, then register with your local DogSmith for some training classes. Get Involved. Your Local DogSmith may be a Licensed Instructor and/or Assessor. They may list group classes that are open for enrollment or be able to help you work through the program in private lessons. To earn your Pet Dog Ambassador title, you will have to work through the training and then enroll your dog into the program. Your local DogSmith can help you do this. The Ambassador levels are as follows. On successful completion of each level you will receive a certificate and a medallion for your dog. Contact your DogSmith today and get started!